Give the Gift of Go. With over 325 destinations and limitless adventures to choose from, this Delta gift card opens up a world of possibilities. Delta gift cards can be used toward airfare on any Delta marketed flight through delta.com, at the airport, through Reservations, or by phone with Delta Vacations®. Please allow at least 24 hours for card to be activated. To redeem or check balance, visit delta.com or call 1-800-221-1212. Use of this card is subject to these terms and conditions and those found at www.delta.com/giftcards. This card may be only used toward the purchase of air transportation on Delta Air Lines-marketed flights and may not be used to pay other amounts, such as baggage fees, in-flight purchases, seat upgrades or other ancillary products. This card will not be replaced; is not refundable and cannot be exchanged for cash, check or credit except where required by law; and may only be sold by Delta-licensed vendors. This card is issued by and represents an obligation of Delta Gift Cards, Inc.
•	The eGift Card Number and Redemption Code located in the digital Delta eGift Card ("eGift") or on the back of the physical Delta Gift Card ("Card"), as applicable, are required for redemption. 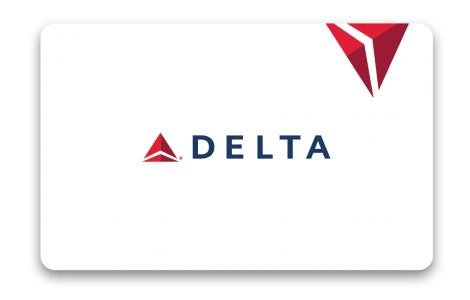 o	Call Delta Air Lines Reservations and advise the agent that you are redeeming an eGift or a Card. In the U.S. and Canada, call 800-221-1212 or 800-225-2525; in Japan, call 0570-077733 or 0476-31-8000; and in all other countries, call the local Delta Air Lines Reservations office. This method of redemption may result in direct ticketing charges. o	In person at a Delta Air Lines City Ticket Office (CTO) or with Delta Air Lines Airport Customer Service (ACS). o	Through a Delta Air Lines General Sales Agent (GSA).